I can't help but think about my sketches as little animate objects. And its funny how some doodles, like people, refuse be ignored...they keep popping up for attention and simply aren't happy unless they've been posted for the world (ha, or at least those of you who read this blog...thank you!) to see. This is one of those drawings. In case you're wondering, Tommy (the foot's owner) is my department chair, and one of the coolest people I know...but I think his casual footwear already says that. 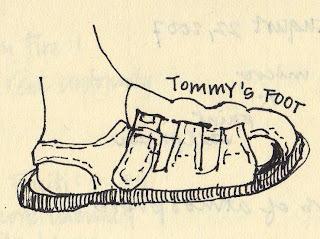 Oh my goodness- I didn't even have to read that this was Tommy's foot before knowing it from the sandal alone- some things don't change! Nicely captured, Suzanne!